Thanks to an email from Caryn (from JustaLittleSweat), I recently got to know about Carpe Antiperspirant Lotion. Now, I have tried several antiperspirants for hands in the past and none of them stuck (pun intended). However, Caryn's email got me a bit curious about Carpe and I decided to give it a try. I ordered Carpe from my favorite store in the world (right, Amazon) for $14.95 and got a shiny 1.35 Ounce (40 ML) pack the next day. This post is my review of how it worked out. You must note that this is my initial experience after trying out Carpe for a few days. I still do not know the long term impact.. hopefully I will write another post once I have had chance to see this in action for some time. The active ingredient in Carpe Antiperspirant Lotion is Aluminum Sesquichlorohydrate (15% ). Aluminum Sesquichlorohydrate is used as active ingredient in several antiperspirants available over the counter today (most notably the Mitchum line of products), and is found to be effective for palmar hyperhidrosis without significant side effects by atleast one study . However, there are potential side effects of this compound (including respiratory toxicity, asthma etc). It is also one of the restricted components for cosmetics in Canada. Apart from Aluminum Sesquichlorohydrate, Carpe also contains other ingredients including Eucalyptus oil that provides a pleasant scent on application. All in all, its a relatively simple formula. As per the directions on the pack, I washed and dried my hands before application. Once hands are dried, I applied a small amount of the lotion on my hands ans rubbed it all around for 10-15 seconds. Initially it was a bit sticky, but once it dried up I could not feel it anymore. The effect was instantaneous and my hands were dry like never before in a matter of minutes. It did get a bit too dry, and I felt a bit of itchiness due to extreme dryness. However, I will take that over sweaty hands on most days. Over next few trials, I will try to find the right amount of lotion for my condition – one that gives me dry hands without extreme dryness. The first time after I applied the lotion, I needed to wash my hands again as I touched my pet birds. I was a bit worried that the lotion will get washed off and I will need to apply it again – but I was wrong. This stuff holds on to its own even after thorough washing. My hands were totally free of sweat for the entire evening. That was great as I had to meet a roomful of people and it was great to feel 100% dry hands while extending my hands for handshakes. I am writing this after about a month since I wrote my initial experience (above). 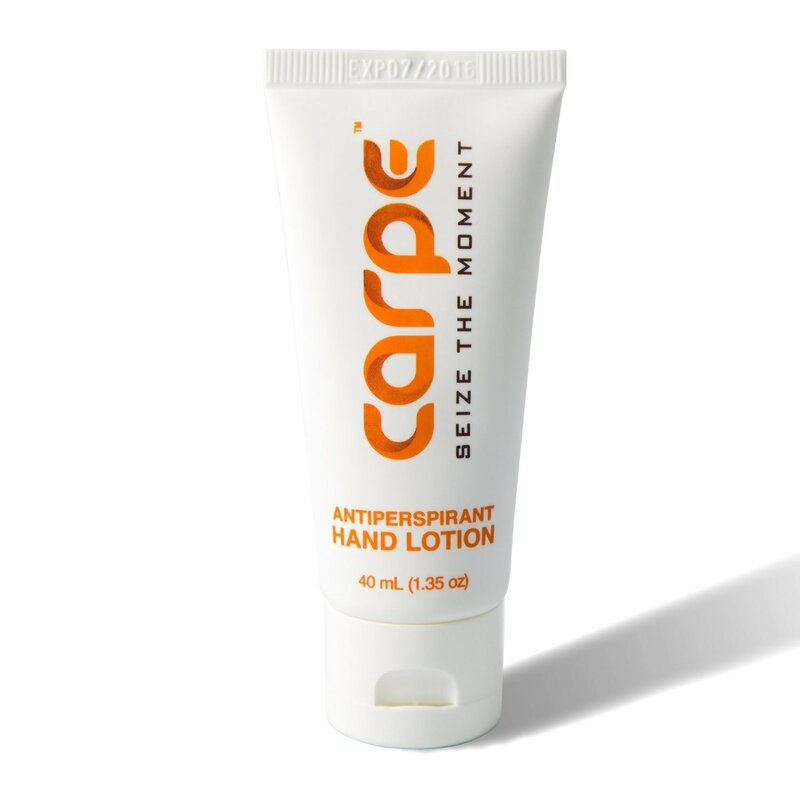 In the meanwhile, I have tried Carpe Lotion in a variety of places/situations and have had somewhat mixed results. It does work very well in most cases – the sweating on the hands is down by 80% on most days/situations and that is a great thing. However, once in a while it simply does not work. I haven't been able to find the factors which will make it work vs. not. Stress and humidity are surely two factors that reduce the effectiveness a lot, but don't explain all the variance in my experiments. Times when I had to have an important meeting and needed sweat-less hands, that's when it failed! Other times, it was a bit cloudy/rainy/humid and the sweat broke out almost as soon as I applied the lotion. Overall, Carpe looks very promising and really works great! This might be the best solution to one off days when you are going for a date or interview or a social occasion and are not on iontophoresis or oral medication. This is easy to apply and can be used at the last minute instead of planning in advance. I think this is one of the best over the counter antiperspirant solutions available for hand sweat. Nothing else I have tested came close in terms of effectiveness or ease of usage. However, it falls short of being the only thing you could rely on to get through palmar hyperhidrosis. You'll need to supplement this with other tools in your arsenal to really manage your hyperhidrosis. I still need to research a bit more on how safe Aluminum Sesquichlorohydrate is in the long term. As of now I am not fully comfortable recommending this to children, or people who have sensitive skins or people with history of asthma or other respiratory diseases. I might be over-reacting to some of the stuff I found on my initial research, but better safe than sorry! NOTE: In the comments below, you can see discussion around the research on Aluminium Sesquichlorohydrate. The manufacturers believe its safe for the concentration they have used in the product (15%). I have not independently verified it yet, but wanted to let the readers know in any case. Go ahead.. try Carpe if you suffer with Palmar Hyperhidrosis. Its not a long term solution like iontophoresis or oral medications, but a great addition in your kit to manage hyperhidrosis. 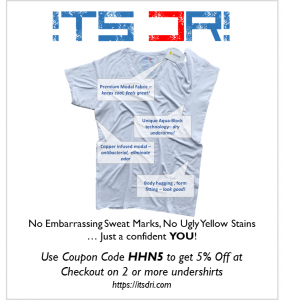 PPS: Like most people suffering with excessive hand sweating, if you also sweat from underarm area, I highly recommend you to check out this article on sweat proof undershirt. Through the years i am always aware of shaking hands without sweaty palms, but months past by i feel so uneasy due to the noticeable sweaty hands i start to get panic so i immediately ask for help then i found out the the carpe antiperspiant hand lotion is really effective in getting rid of sweaty palms problems so i finally used it everyday as long as i feel sweaty and amazingly it is 100% effective. Having a wet hands/palms is very irritating it feels like my life is ruined with this problem ! Tried my friends advice i did used the Carpe Antiperspirant Hand Lotion , then wow after a few days of using this product i can confidently shake hands in any persons i meet without sweating. must try this effective lotion! My palms were so wet paper I was writing on became soggy. I tried several treatments. Nothing works for long, there is no magic cure. 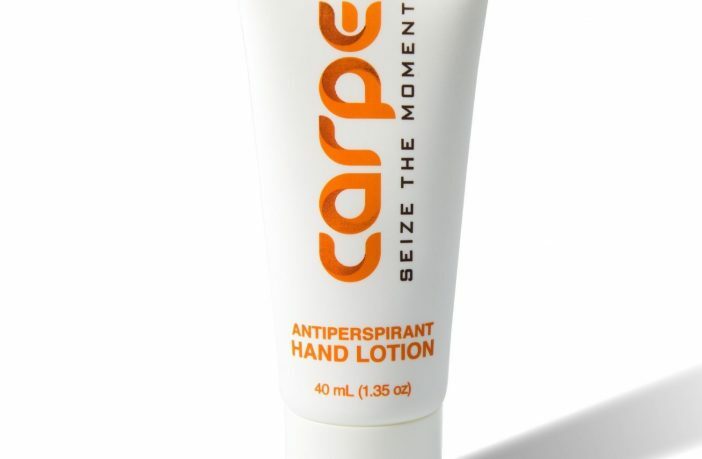 But when this add Carpe Antiperspirant Hand Lotion appeared, i immediately buy and tried the Carpe Antiperspirant Lotion and used it as my daily treatment for my sweaty hands . I was so amazed in this product because my sweaty palm became dry ,and whenever i go i always bring my best buddy the carpe antiperspirant Lotion. I was not expecting to like this product as much as I do! A very small amount disappears into your palm and sweat for at least 48 hours without another application. I haven't had embarrassing sweaty hands in a while now. I would highly recommend this product. Great review! Thanks for the rec. Just fyi, I have done a lot of research on antiperspirant active ingredients. Based on the literature, aluminum sesquichlorohydrate does not have any side effects at a concentration of 15%. Once you get above 25%, potential side effects exist, but even these are not backed up by significant research. The concerns you brought up really only exist in aerosols. Thanks Dave… you are likely correct. I haven’t done that thorough a research yet. If I do and find the same, I will update the review and my comments on the concerns around potential side effect. Can you point me to any online research source providing more information? Sure thing! Most of the research was into the FDA Final Monograph for Antiperspirants (http://www.fda.gov/downloads/Drugs/DevelopmentApprovalProcess/DevelopmentResources/Over-the-CounterOTCDrugs/StatusofOTCRulemakings/ucm110774.pdf). I also used Casarett and Doull’s Toxicology. The Basic Science of Poisons, 5th Ed. This book discusses the potential respiratory side effects of the active in aerosol form. The raw active is very easy to inhale, which can lead to problems, but the active is not in it’s raw form in this product, so inhalation would not be possible unless someone swallowed the lotion, which I would hope no one would do. I also used this research study: http://onlinelibrary.wiley.com/doi/10.1111/j.1529-8019.2008.00199.x/abstract. I was able to rent it for $6. I hope that this helps! Any word on how well this works on feet? Not yet Rachel.. haven’t tried it on my feet yet. I will update once I do. If you end up trying it on feet before I do, please drop in a comment! Thanks for the comment Angela. Ofcourse, do what you feel comfortable with. Just a data point – I have been a chronic sufferer of Asthma for a long time. I have used Carpe quite a bit and haven’t faced any adverse effects (yet). I guess it depends on how pained you are with your sweaty palms. If you are enough, you can try a small dose of Carpe and see if you get any bad effects. In the end, I don’t mean to give any medical advise. If you have any doubts, ask your physician. Thank you for the post. I am about to get it. I am already using antyhydral. I will try it by using both at the same time. Antihydral has been very efficient. However, it is not like 100%. It’s like 70%. Maybe Antihydral + Carpe will be more efficient. could you tell me how it worked for you by mixing them? i bought both but i haven’t used any yet. Well, I was not succeed by mixing them. In fact, Antyhydral is the only one that has worked so far. Unfortunately, carpen did not work in my case. Btw, I started sweating even more so I quit. I hope either carpen or antyhydral get you sweat free. I received a sample of this product a few weeks ago and immediately felt results. I was recommending this product the day I tried it! What was great about this product is that it is a non-invasive solution for sweaty hands. It’s something you can take on the go and use as you need it. It can be used daily and will keep your hands sweat-free for hours! 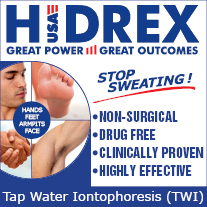 I find this product especially good for people with hyperhidrosis who have not yet explored other treatment options, children with HH, and people who have occasionally sweaty hands. For people who haven’t explored any other treatment options, this lotion is the perfect way to start. I like this product. Effective for me, it absorbs quickly with no chalky residue, a little goes a long way so there is no need to apply like a regular hand lotion and slather it on. Use a dime size amount and work into your palms and allow it to dry. It is non-greasy, and has non-irritating feeling. There is also no residue. Because of moisturizing components, the lotion leaves your hands feeling natural and sweat-free, not necessarily dry. I have some pretty severe hyperhidrosis so my hands sweat immediately after i wash and dry them. will carpe still work if i apply it with sweaty hands? Hi, just checking the product out for my 16yr old son who complains about sweaty feet non stop. I didnt know there was a medical issue with it. I found you by googling the safeness of the product. In regards to the asthma side of all this. It fully depends on each and everyones own tolerance to the product and could also depend on how their asthma is at each time they apply it. Now typing that I just had the thought that the % of aluminum that is “safe” by the literature, is also dependent upon each persons make-up. Like you told another commenter its up to them and their Dr to find out if it could be safe to even try it. Hi I’ve suffered from palmar hyperhidrosis for a few years now since I was a teenager. Even my feet sweat a lot too. After reading this post, I thought I might give this product a try. However, I couldn’t find this product from where I live and they do not shipped here. What should I do? Your response is very much appreciated! Thank you. Hello Joyce – where are you from? Carpe is just one of the several products, and it is likely that your location has some equivalent products. You may want to search for hand antiperspirant, palms antiperspirant or other such keywords. If all else fails, generic clinical strength antiperspirants that come in concentrated form (e.g. roll-on) may also work for this purpose, though less convenient.